Your inner history buff will appreciate Rock Church and Helsinki Cathedral. Get a sense of the local culture at Sea Fortress Suomenlinna and The Esplanadi Park. 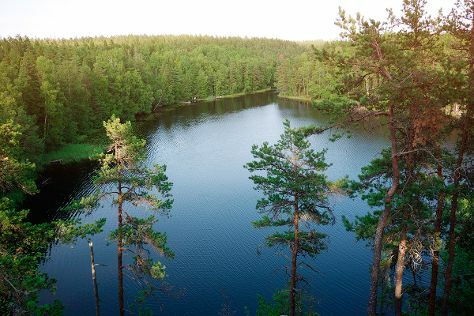 Get out of town with these interesting Helsinki side-trips: Espoo (Nuuksio National Park, Arctic Expedition, & more) and Sipoonkorven Kansallispuisto (in Vantaa). There's still lots to do: take a stroll through Katajanokka, contemplate in the serene atmosphere at Kamppi Chapel of Silence, relax and rejuvenate at some of the top local wellness centers, and take in the pleasant sights at Uutelan luontopolku. To see maps, ratings, other places to visit, and more tourist information, go to the Helsinki trip planner . Newark, USA to Helsinki is an approximately 17-hour flight. The time zone difference when traveling from Newark to Helsinki is 7 hours. Prepare for a bit cooler weather when traveling from Newark in June: high temperatures in Helsinki hover around 65°F and lows are around 50°F. On the 14th (Fri), wrap the sightseeing up by early afternoon so you can travel back home.